Patch 7.0.3 is Live: New Pets & Models, Pet Tuning, And More! UPDATE: There have been a few reports that winning a queued pet PVP match has a chance to reward Pet Charms and battlestones. Also, it should be noted that Garrison Perks have been removed. This includes the reduced cooldown on Revive Battle Pets from the Menagerie. The ability now has a standard 8 minute cooldown even while in Draenor. 96 new pets have been added to the game! Keep in mind these pets cannot be collected yet, and will only be available once Legion is released. Players can have a small taste of what's to come and preview all of the new pets in the Pet Journal — which pet are you most excited to collect in the expansion? The pre-expansion patch isn't without its goodies! Two new pets will be available to collect prior to Legion's release. 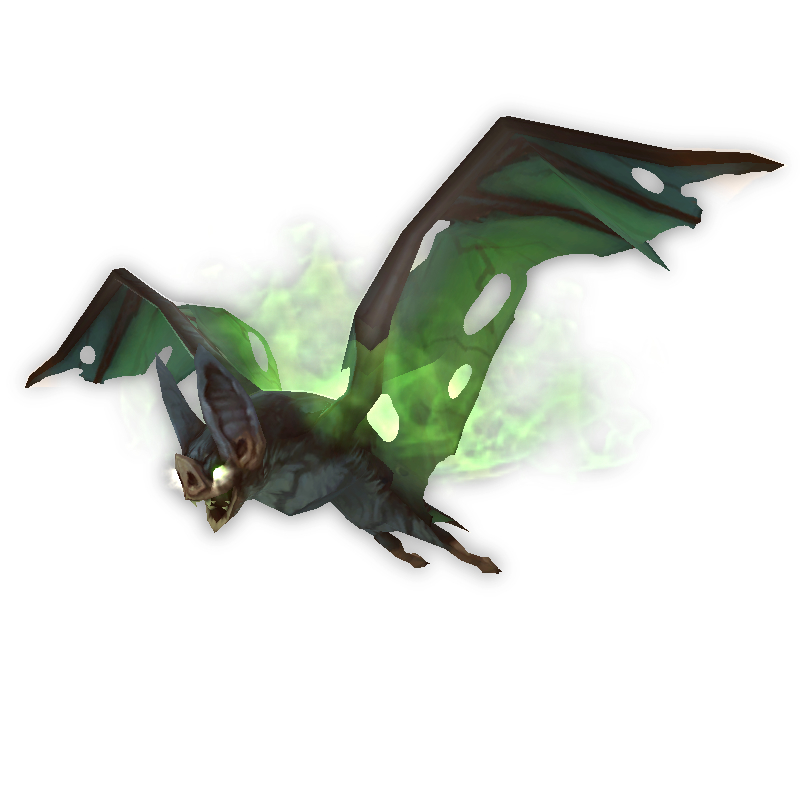 The first pet, Felbat Pup (pictured right), is an event-exclusive pet that uses a new bat model. It can be purchased during the upcoming Demon Invasion event. This World Event is scheduled to begin early August of this year. Completing open world scenarios will reward Nethershards, which can be spent at special vendors in Stormwind, Orgrimmar or near each of the invasion points. Check out Wowhead's guide to Demon Invasions for more information on how to acquire this new pet! Be sure to take part in these invasion scenarios as the Felbat Pup is considered event-exclusive. Once Legion is released, this pet will likely no longer be purchasable. It can be caged though, so it may pop up on the Auction House from time to time. 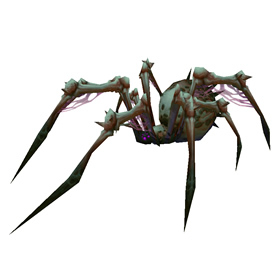 The second pet is the Nursery Spider (pictured left), sold by none other than Breanni in Dalaran. It costs 200 gold and players can pick up this little arachnid right now! Better have a battlestone ready; it's base quality is uncommon (green). The Felbat Pup isn't the only pet with a new look. 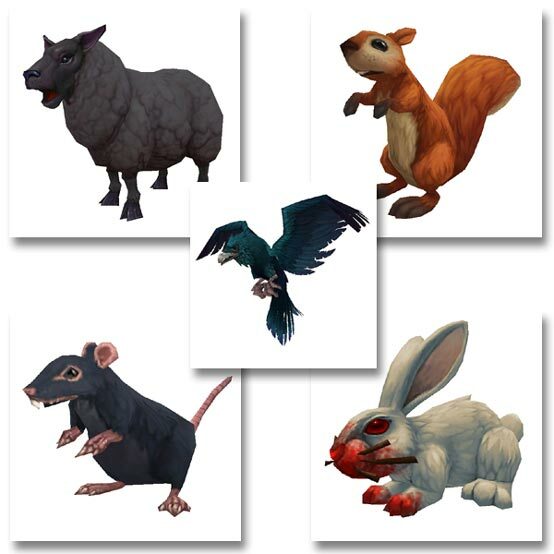 A few existing pet models have been updated with fluffier, less-polygonal appearances. With the large influx of new pets and model updates, we're still diligently working on updating the WarcraftPets database. Thank you for your patience and your continued support. Stay tuned, we'll be rolling out new pet profiles and updates in the coming weeks. A few changes were made to pet-related activities. Pet Charm rewards from Draenor Pet Battle dailies have been reduced (roughly cut in half). The Brawler's Guild is now on hiatus. We hope collectors managed to collect Clock'em! If not, don't worry. The Brawler's Guild will return at an undisclosed date during Legion. In addition to the changes listed above, there are also some quality of life updates. Players can now use spells, abilities, and other toys while transformed using the Magic Pet Mirror. Entering combat will still remove the costume. 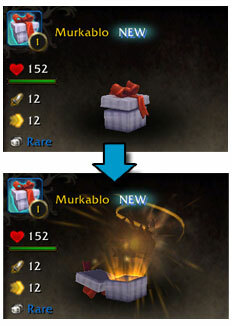 Promotional pets and companions purchased from the Blizzard Store now initially appear in the Pet Journal as wrapped gifts that players can click on to 'open', causing an unwrapping animation (example pictured right). This special effect cannot be applied to pets by players. The Pet Journal now has additional search functionality, search and filter by pet ability! Example: Typing "Flock" into the search bar in the journal will return a list of pets with the Flock ability. This can sometimes lead to mixed results, however, as some abilities share names with zones (Howl and Howling Fjord, for example). Bonkers can now be caged. This battle pet comes in multiple breeds, so it's a great time to clean up (or add to) your collection! A new category was added as a source in the Pet Journal — Discovery. Currently only two pets can be filtered using this new category, both upcoming Class Order Hall Mission rewarded pets. Blizzard first announced possible pet tuning changes during Legion Alpha, and have since updated that list with additional changes. A few changes were scrapped, however nearly all of the proposed adjustments are now live. The following is a list of the Pet Battle tuning changes released in today's pre-expansion patch. Undead racial - During its invulnerability round, the active Undead pet will now do -25% damage. Frog Kiss and Sleeping Gas, both now have a 1-round cooldown. Thunderbolt and Avalanche now have a 5-round cooldown. Graves' base stats have been changed. At level 25, Graves' Speed is now 244 (was 211), Power is 297 (was 314), and Health is 1587 (was 1668). Graves' abilities Consume Corpse and Grave Destruction have been swapped. Cleave damage has been reduced by 25%. There are also a few undocumented changes. Please note that we're currently investigating these unlisted changes, and that ability tooltips on pet pages may not appear properly yet. Explosive Brew has had its damage reduced. Primal Rage now only lasts for 5 rounds. Healing from Stone Form has been reduced. Screeching Gears has had its damage increased, however it now has a 1-round cooldown. Eyeblast has had its damage increased, however it now has a 4-round cooldown. Whirlwind has had its damage reduced. Such nerfs! Without really knowing I guess its the pvp that destroys and rules over the pve battles. Same as for raiders vs pvpers, too powerful in pvp=nerf spell=pve ruined. Battle Pet event is on the calendar for November. Blizzard doesn't care whether we level our pets on a regular basis or not. Yes, Stone Form functions as advertised now. Quite a large heal every round for 3 rounds. Corefire IMp's model has also been updated. @Ajattara: Blizzard has not made an official statement on what is going on with the Menagerie dailies yet, so we still can't say for certain. @Mimimousegirl: Yes, the Pet Battle Bonus Event will be back in Legion at an undisclosed date. I believe they're updating the schedule for all Bonus Events. I don't see the Pet Battle Bonus Event on the calendar. Will it come back with Legion? Any word on the Quest 'Mastering the Menagerie"? I used to be able to do it on every alt, now it seems it's account-wide. Can we verify/confirm? Are the garrison dailies supposed to be available for all characters on account or just for one? That updated chipmunk model has me grinning from ear to ear. I hate to break it to you all, according to the GM that I am having a chat with, the daily quest offered by Lio the Lioness(alliance) is now ACCOUNT WIDE. The ability to get it across multiple toons is a BUG that they are planning on adressing very soon. Not only do you get Pet Charms from Pet PVP but also these Yellow level stones. This should be added! Account 1 - 4 Alliance and 2 Horde (all 100) - The 4 Alliance got the daily finished, and the 2 Horde did not have it available. Blue ! was there but quest not available, and then after reloadui, it was gone. Account 2 - 2 Alliance and 2 Horde (all 100) - Only 1 Alliance got the daily and all the others same as above. yesterday I got 6 of 10. Today, just 5 of ten. I think I'm going to put down a bet in LV that tomorrow I can only do 4 characters total! Hahahahaha! Yesterday was able to do the daily on the 3 mechanical turkeys on 6 of my 10 characters. So here's a morning toast and coffee and hope that things are being fixed and in better shape today! I'm keeping track of my notes on the Forum, under the Pet Battles section. I wonder what happened to the 'shiny' skin of the Mountain Cottontail? Mine looks YELLOW (yes, with a shine) in pet journal, but the summoned version is just plain white. And at some point I even thought I saw it turn brown for some time. Such a shame if this skin is now broken! I was only able to do the daily with two of my three level 100 characters today--does anyone know if that's a permanent change with the patch or a bug?